I sat through all of Endless Eight, or rather, I nearly did. I fully intended to, which is the important thing. Watching Haruhi for the first time now is like reading an old newspaper. In 2006, it was about as ubiquitous as anime gets. The dancing ED, the fake first episode, the way the TV broadcast was all jumbled up and yeah, that concert scene. People just wouldn’t shut-up about it, and it seemed to kick-off that whole moe thing, too. Therefore, I couldn’t bring myself to watch it for 5 short years, but such is my odyssey in anime blogging that today was always inevitable. We’re a bundle of contradictions, anime bloggers. Anyway, for a series as venerated as this, it wasn’t as extreme as I was expecting and began for me more as a tour guide than an actual piece of storytelling. I softened up with every further episode, though. It wasn’t the moe purgatory I’d feared, but it isn’t the masterpiece that the ghost of anime past would have you believe, either. I’m just glad I finally got over that hump. This is all stuff I felt like I needed to say, but generally speaking, I’m impressed by how Kyoto Animation approached the series. In lesser hands, it would’ve never been as interesting or subtle, but almost everything that’s great about it can be attributed to them. It has a strong sense of independence and I’d like to think that’s truly why it captured so many hearts. Watching Haruhi like this though brings one huge obstacle: Endless Eight. Calling it audacious would be an understatement. After 3 years of waiting, the fans finally got their new series, but Kyoto Animation would soon be drinking their delicious tears by the bucket-load. I couldn’t help laughing to myself at the abrupt end of yet another episodic loop and imagining the sheer demented exasperation it generated. To be honest, I liked Endless Eight quite a bit. I’m sure I’d feel differently if I were watching it week-in week-out for 2 months, but I was able to see it more as a 3-hour movie. It isn’t merely the same episode repeated 8 times, either. In terms of pure filler, Naruto is about as bad as it gets. I can’t watch that, but Endless Eight, despite the admittedly repetitive jokes, keeps things interesting enough to seem a real artistic endeavour. It elevates the significance of every passing moment, how everything, or any place, can seem so different the second (or, indeed, eighth!) time around. 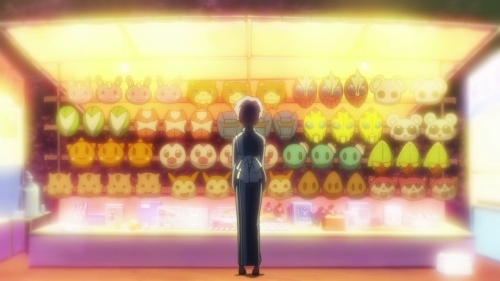 As it wore on, I became fascinated by Yuki Nagato at the night festival, standing in-front of that glowing wall of masks, each representing a different path; a symbol of the endless possibilities in life; all delivered in her trademark expression of indifference and sadness. It reminded me of Watashi in the last episode of The Tatami Galaxy, finally stumbling out of his room into a human kaleidoscope of a road; everyone around him is changing, their clothes, hair-styles, even company: a woman walking alone is suddenly holding the hand of a small child, the next moment, a boyfriend on her arm. 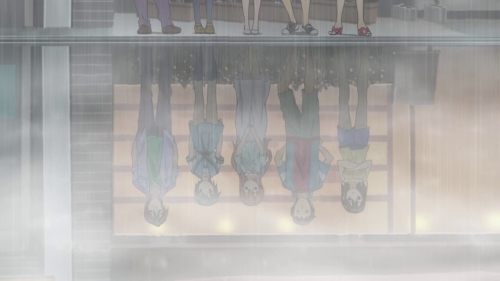 In the end, I watched the last episode of Endless Eight thinking it was the seventh. I only realised something was wrong with 5 minutes left to go and, by then, it was too late. I could never go back at that point, therefore, I can never say I watched all of Endless Eight. This is likely to be my last post before Christmas and, that being the case, I hope you have a good one! This will be the blog’s sixth Christmas and, sooner or later, she’s going to realise that Father Christmas isn’t real, but for now, she still believes! I think the thing that made Endless Eight more painful (or more hilarious) as it was airing was nobody knew at the time it would air for 8 episodes. People kept tuning in thinking it would end, only to end the exact same way all over again. Yeah, the whole idea of people thinking “Surley… this week?” only be to be greeted with Kyon and his bedroom again made me laugh. Crazy to think they actually tried something like this with a series as popular as Haruhi! Takes a certain amount of balls, that’s for sure. Kudos to Kyoto Animation, to think Yutaka Yamamoto tried to apologise on their behalves! I agree, Kyoto’s non-linear work definitely elevated this show beyond Its flat premise. What stands out though is that omnipresent fantastic animation work here. Such beautiful lines, and exquisite movement. Characters exude personality because of their many gestures and body language, which Kyoto have mastered thanks to the Key Adaptations. Every frame is filled with such exuberance makes every scene worth a mention. Not sure about the second season though, as I’ve decided to avoid it at all costs thanks to Kyoto’s insistence on pulling around their fans with a dog collar. Nice post, buddy. I made it through about 3 and a half Endless Eights before I gave up, and I never finished the rest of the season because I was so annoyed about it. The key thing to it, at least for me, is preparing yourself for what Endless Eight is. That should help you not to feel annoyed about it all, anyway. Give it another go sometime? Art and animation are great. The story is pretty darn good for being so episodic sometimes. BTW, I watched every single second of Endless Eight as it aired. 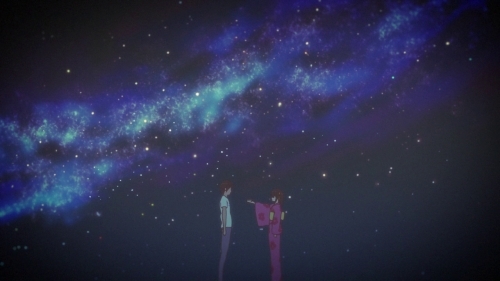 In alot of ways, I think of Haruhi as kind of an anime event – less a story than spectacle. As such, I think Endless Eight is just another way it flaunts this. Frankly, I kind of enjoy that part of haruhi – the part that’s less concerned with coherent, innovative and that ever-nebulous term, “interesting” narrative than it is with messing with people, and making them pay attention. One of the most interesting parts of Haruhi is how anime watchers react to it. On one extreme, particularly at the time of its airing, you have/had your “Haruhiism” followers, on the other hand you have people who absolutely rail against the series. It sort of reminds me of the reaction that Lady Gaga garners – you either love or hate her, and either way, its rare that someone remains un-opinionated. One of the interesting things about watching Haruhi now is trying to understand how it became so popular in 2006. It’s a good series for sure, but I’m really at a loss to explain why it caught on so strongly back then. I’d forgotten about that whole Haruhiism thing, but the idea of a cult being built up around the series seems so strange now. For all its deserved acclaim and derision, and very real impact on the direction of the anime medium, the unique combination of concept and presentation of the story Haruhi Suzumiya is something I had never seen before or since. That so many tried and failed to replicate the success of its brand makes it stand out all the more in my estimation. That I came across this series during a transition in my own life makes it personally unforgettable. I know what you mean. Even though I didn’t actually watch the series in 2006, I made a rather loud effort not watching it! As such, it holds a similar kind of nostalgia for me, too. It appeared just as I started anime blogging, after all. I still getting my feet wet in the anime world when the original series came out. Even so, I can say I’ve never seen a first episode done so well, whether in anime or not, before or since. From that point on I rode the original fan wave with all the others with no regrets. I’ve heard Endless Eight can be rewarding, but I was one of those who decided to skip to #8 as soon as I had figured out what they were up to, and overall I enjoyed the second season less. But that first season showed me that not only did anime have great potential as both an artistic and entertainment medium, but there were shows out there that were trying to live up to it. I wonder how I might’ve approached Endless Eight had I been interested in Haruhi when it was airing. I can imagine that 8 whole weeks of it would be quite infuriating, but it seems a same that so many people seemed to bail on it. Every episode tackled the same basic plot in a different way, with different styles of animation to boot. I watched Haruhi Suzimiya about a year and a half after it aired because of the over-hype. I enjoyed it when I finally did watch it though. Is the second season worth watching? The endless eight makes me want to avoid it. The first season was good and I don’t want to taint the experience. I liked that the episodes were out of order and don’t want to see them in order! I watched the first series in broadcast (jumbled up) order, too, and wouldn’t have it any other way. People complain about Endless Eight, but if you’re able to sit through a 3hr movie, I’d suggest trying it all in 1 hit, it’s not as bad as it’s made out to be– it’s actually quite good. The only thing I disliked was the repetition of the same jokes, over and over. Glad to know someone else who doesn’t despise Endless Eight XD Since Haruhi is my favorite series (read all the light novels, own tons of merchandise, etc.,) I’ve watched all the episodes of Endless Eight at least twice each. I’ll admit it was a bit annoying watching it as it aired and not knowing when it would end. But watching it again when I finally bought the DVDs was much more enjoyable. I liked picking up on all the differences between each episode and ogling at how good KyoAni is at portraying atmosphere in their series. 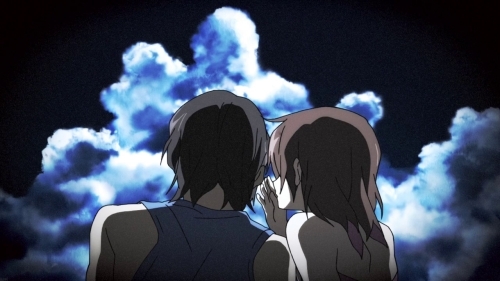 People seem to not know that Endless Eight did have some reasoning behind, mostly due to KyoAni’s plans for the Disappearance movie and needing to air all the novel stories that happen chronologically before Disappearance. With the episodes from season 1 plus Bamboo Leaf Rhapsody, Endless Eight, and The Sigh, it wouldn’t be enough for a two-cour season, so they made more Endless Eight episodes (it was just one chapter in the novels). I suppose I’m on of that minority of people with little or no opinion that Celeste mentions – the number of people I’ve spoken to about the whole Haruhi franchise who *don’t* care much for it either way can be counted on one hand. That really is quite something! I recall following the original series way back…I believe it was one of the shows I cut my blogging teeth on actually. Even then, my opinion was “it’s fun and all, but what’s the fuss about?” and I never did grasp what made it so special for everyone else. That said, I read the English version of the first light novel, and really liked it. I think Kyon’s commentary with its dry, sarcastic wit works really well in print for me. I don’t think Endless Eight could have worked at all had the first season been the roaring success that it was. The production team realised this, so duly went out to see what they could get away with. That’s my interpretation of what happened, which may or may not be an accurate assessment of it!